Thanks to SAS Admin for another great job on these forums. The support here at SAS, for the biggest Supermod in Il2 history, is second to none. Then again; in all things Il2 SAS is always second to none. We have come to expect this level of quality even as we so often take it for granted. Now that we have a B.A.T. dedicated forum we shall create a reference page for all the downloads. There will be direct links to the initial install section and the six expansion packs. The B.A.T. Manual will be listed at the top and should be the first download for anyone considering this upgrade. 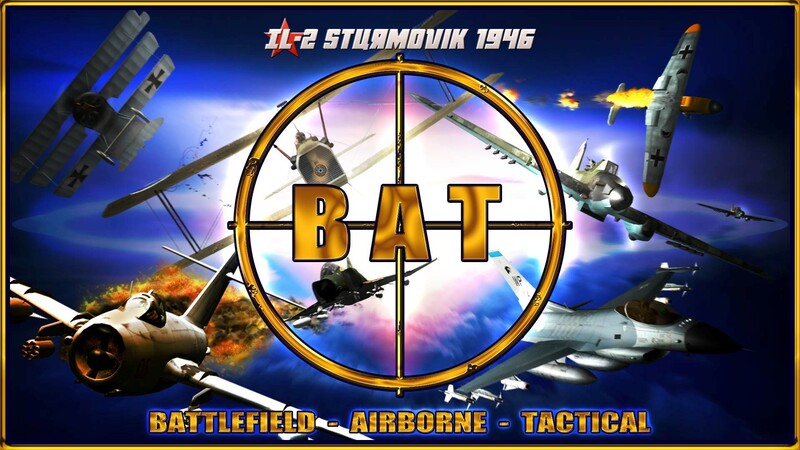 Battlefield - Airborne - Tactical comes from the fact that this Supermod (please don't call it a modpack, this is WAAAAAAY bigger), B.A.T. modifies the entire Il2 Simulator, from the ground objects and shipping fleets, to the aircraft and finally the new maps and functional picture with Command and Control. Battlefield - Airborne - Tactical summed up what we were trying to achieve. One of our core members of Hangar-19, RDDR, then pointed out the snappy acronym reminded him of military acronyms he had previously encountered. eMeL's brilliant design, with the B.A.T. letters in the crosshairs, sealed the deal. SAS~Storebror's installer, selector code and loading message made the whole thing possible. For my part, 79 previous C.U.P. packages became 29 B.A.T. packages, and the super-easy install was born. Thanks also to DPeters95 for lending us his experience and expertise to thoroughly check over 400 maps in B.A.T. KevinHoggard also tested an advance copy for us and worked very hard to test the install process. Kev effectively downloaded everything 2 or 3 times, thanks again mates. Along the way we integrated PAL's Utilities which in turn has fixed the LASTQUICK bug. It is now possible to leap from era to era, change to any plane on any map and QMB yourself to oblivion! If you do encounter a QMB MISSION, QMB MISSION, NEVER MAPS, QMB MISSION that doesn't load or work for you - You will already know, from reading the B.A.T. Manual, page-13, that this is because B.A.T. has expanded so fast that QMB hasn't kept up. Simply enter FMB and edit the QMB MISSION in order to fix it, expand it, clone it, whatever. QMB will continue to improve and expand. Several dedicated enthusiasts are already working on it as we speak. There have been a few teething troubles. It is a lot of material to upload and a few gremlins messed us about at the start. The Jet Age code is particularly complex and slippery at times, but well worth the effort to integrate across the board. The B.A.T. Jet Age flightline is already the largest such collection of Jet Era material in any one place for Il2. 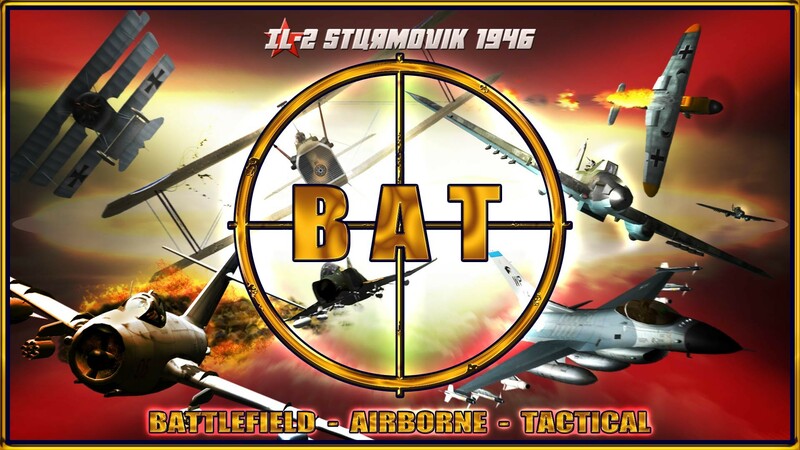 If you want to be ready for the next generation jets in Il2, and there are some spectacular things coming, then B.A.T. is going to make life a lot easier. The same is also true of the Dawn of Flight aircraft set. As of Expansion Pack Six, where a huge effort was made to upgrade all WWI aircraft to the latest versions functioning in 412, the flightline itself has reached 180 aircraft! This is well above anything else for this era and includes more excellent 412 compatible mods, the Gothas, Caudrons, Avro 504s and many more. Any missions or campaigns made in C.U.P. will be compatible with B.A.T. with the exception of those that add trains. The trains have improved. In any case here we go again, opening up old missions and writing new ones. The difference this time is that B.A.T. feels complete, taut, easy to install, more popular than ever. SAS~Storebror has given us a torrent as well. Whatever fubars crept into the early expansion packs were quickly cleared up. But the Initial Install is ROCK SOLID and will NEVER CHANGE! The individual downloads and the Torrent will always agree. This B.A.T. is in for the long haul and its going to be quite a ride! This massive overhaul will add years to IL2. I wonder what Oleg Maddox and the original crew think of how far their fine initial work has been advanced? For those of us who cannot, for whatever reason, do what you and all of the many, many others who have contributed to this package have given us....Thank You! Excuse manners been on the forum for a week and have not said thank you for this amazing addition to the vanilla 1946. So many thanks to everyone involved, guys. I have just downloaded Il-2 1946 from GoG and the version is 4.13.3m. Is this the correct version to run BAT ? Given that GoG gives you all the files to get up to that version, is there a way to get back to a former version if BAT is made for an earlier version ? One thing to add to the info in that link. Keep your original 4.13.3 version as a master copy. Copy the game folder and apply the 4.12.2 conversion to the copy. If things go wrong you still use the master to try again. I have tried the unpatcher, but it keeps me into 4.13.3m. I think I have done what was required. Someting went wrong. I copied the file on the folder's name, not inside the folder. Is that the wrong thing ? The 4.13.X Unpatcher has been so far downloaded 84 times, unfortunately nobody has provided any feedback of any kind.. The tests I ran were successful but I do not have a GoG download to test it with. I'm new here at SAS, and may I say how grateful I am that I found you. I have played IL2 since it's first release way back when God was a boy (Circa 2001 I seem to recall). I played up until the release of IL-2 1946, and due to many reasons, left the game and computers for nearly a decade. I am amazed, impressed and totally delighted to find that the beautiful game is still around, and wish to say thank you to all the Modders for their excellent, untiring work. I am currently running three installs, stock 4.13.4m, VP_modpack and just recently added BAT v3.01. It's absolutely brilliant. From and old gamer who has returned to find the game much improved, - a heartfelt thank you!